On the eve of World AIDS Day, AVAC is excited to share our annual “state of the field” report on biomedical prevention research and implementation. 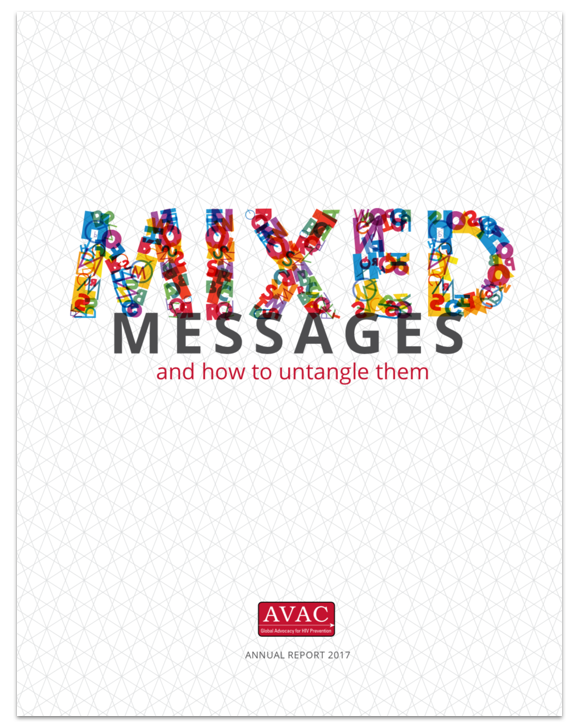 AVAC Report 2017: Mixed Messages and How to Untangle Them is straight talk about today’s complex context for HIV prevention. What does it mean when there’s more rhetorical support than ever before for primary prevention for HIV-negative individuals—but no more money? How can there be talk of being “on the path to epidemic control” while human rights remain in shambles in many places, and rates of HIV diagnoses and deaths climb in others? How can scientists be so sure they know what women (or anyone at risk of HIV) want, without doing research to find out? This year’s report offers answers, in the form of analysis and recommendations for change. We hope you’ll read it and, more importantly, join us in action to make the recommendations a reality. The report also provides valuable context for some of today’s exciting developments, including the launch of two efficacy trials: HPTN 084, which is evaluating a long-acting injectable antiretroviral for prevention in women in sub-Saharan Africa; and HVTN 705/HPX2008, a vaccine trial of a novel “mosaic” strategy that might block multiple viral strains. These two studies aim to enroll nearly 6,000 women in East and Southern Africa. Both trials are planned to run through 2022; both could pave the way for valuable new long-acting prevention options. As the report describes, now is the time to structure research networks and agendas, oral PrEP programs and comprehensive approaches to HIV prevention in such a way that they lay the groundwork for strategies like those being tested in these trials. At the same time, we cannot assume these strategies will solve issues posed by user-dependent methods like condoms, oral PrEP and more. New data released yesterday from the Rakai Health Sciences Program in Uganda offer a glimpse of what the future could hold. Tracked since 1999, the latest data from the Rakai cohort show a 42 percent drop in HIV incidence over the past seven years, primarily attributed to soaring rates of ART and VMMC coverage in the population. Opinionated, informative and filled with useful graphics, AVAC Report 2017 helps put these developments on clinical trials and combination prevention packages in context, identifying what has to happen, who should do it and how to track progress along the way.